Inarguably, one of the best parts of the job of being a pilot is the view from the office. It is simply incomparable. From a predawn takeoff where the oncoming glow on the horizon is set off by runway and city lights, to perhaps a night run over central Arkansas during a summer electrical storm where bolts of lightning dance around towering anvil topped clouds, the scenery is awe inspiring. I never tire of flying the Expressway Visual into LaGuardia as it takes you directly over Brooklyn and Queens providing an unparalleled view of Manhattan (at least from the left seat). Every now and again we get to fly up the Hudson river when landing on Runway 13, giving copilots an even better view of downtown. The Gateway Arch, the Columbia River with Mt. Hood and Mt. Rainier lining up in a perfect frame, the turquoise blue water off southern Florida beaches or a view of Yosemite's Half Dome and El Capitan from above are all routine sights in this job. I have over the years flown over places like Mt. Fuji, the Arabian Peninsula, Sydney and London to name only a few. 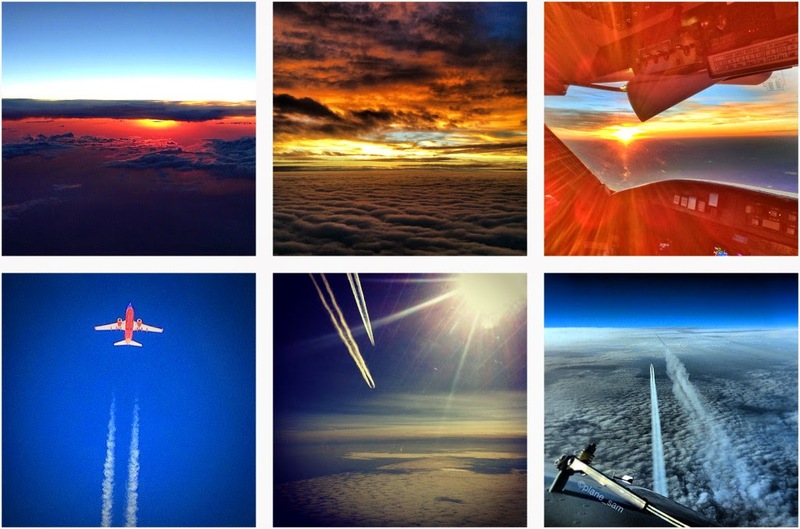 Being naturally proud of what they do, pilots like to take pictures of where they've been and the sights they've seen. And the taking of pictures by pilots has never really been a problem as the photographs taken would usually end up in an album on a shelf somewhere or perhaps on a quickly forgotten hard drive. That all changed with the coming of social media. For in the game of collecting likes and impressing your friends from school who took that accounting job, what better way could there be of showcasing your awesome life than to post pics and selfies from 35,000 feet? And that is more or less exactly what happened. Pictures and videos from the cockpit can, or rather could, be found all over the internet. That is until some killjoy asked the inconvenient question of umm, if you're being a tourist up there, then who's flying the jet? It's a valid question. The answer is a simple one. The other guy or the autopilot. But of course that's an incorrect answer. The people who own the airplanes and the people who ride in the back generally think it best if both pilots are paying attention to the flying part. It's not an unreasonable request I suppose, and certainly not while on approach. This, then, is the setup for the great cockpit photography kerfuffle. In December last year, an online magazine called Quartz published a piece detailing how cockpit photos had been showing up on Instagram, and how the taking of these photos violates FAA rules. In the course of gathering information for the article, author David Yanofsky scraped dozens of cockpit photos from the Instagram accounts of pilots who had neglected to set their privacy controls. These photos, including selfies with names, were then published in the article. What happened next may serve as a signpost to how social media is changing culture or perhaps how already existing trends are highlighted by social media, because some of the pilots who were "outed" in the Quartz expose went on the attack. Author Yanofsky was harassed and threatened himself through many social media sites. Returning fire with fire, editors at Quartz then researched the information of the harassers and contacted the employer of at least one of them. I guess one lesson learned here is that if you are going to engage in online guerrilla warfare, at least learn how to mask your own IP address. As everyone from cops to pilots to doctors and other professionals is finding out, ubiquitous cell phone cameras coupled with social media are rapidly highlighting the fishbowl that modern society is becoming. Living in a panopticon society will have far reaching effects which can only be imagined at this point. This, coupled with a growing distrust of professionals and authority figures, may perhaps induce a reaction to publicly lived and posted lives. It certainly will for the pilots in this article. I personally think that including the names and selfies of some pilots in the article was rather rude as Quartz could've made their point without publishing anyone's personal info. But then again these guys probably should've figured out how to control the privacy settings of their accounts or perhaps just not taken selfies while at work. And some of the pilots involved may not have known that they were breaking some rule or other. In their defense, the rule prohibiting all photography, and not just that below 10,000 feet is relatively new but restrictions on any non-flight related activity below 10,000 feet have been around for awhile. The FAA has said it is not contemplating any enforcement actions as a result of this article and may actually be gratified that this event has served to publicize the new rules. Will this kerfuffle stop pilots from taking pictures while flying? Probably not, but you are much less likely to see any such snaps online.